HomeShort StoriesInspirational StoriesThe 500 Rupees Note that Transformed Rahul! 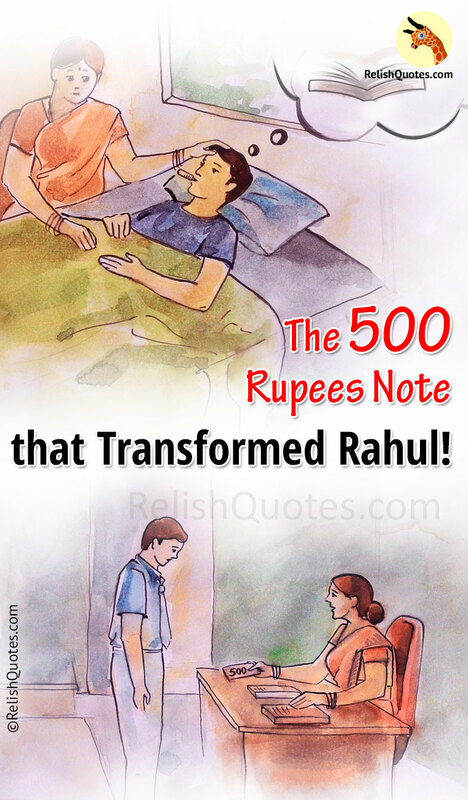 The 500 Rupees Note that Transformed Rahul! Things were going on good until one day, he had high viral fever. His board exams were approaching and he had a series of preparatory exams to write. He was very sad that this time he’ll not be able to do his exams well as he had high viral fever. Rahul had never experienced the feeling of scoring low grades or joining remedial classes. In his School, the kids who scored very less had to join the remedial classes which were taken after the normal school hours. He was scared that he might want to join the remedial classes. His preparatory exam date approached and he hadn’t recuperated from his fever totally. He took tablets and went to the exam hall. He couldn’t even concentrate properly on the answers he was writing as his attention was on his head that was paining a lot. He somehow managed to sit there for 3 hours and wrote whatever he could recollect from the classes. He hadn’t studied anything. Similarly he wrote all the subjects and took 1 week leave for recuperating from his fever. After a week, he was fit and fine. He came to his class and his friends were happy he had recovered from his fever. The answer papers were distributed in the class. He had scored less than 25% as he hadn’t prepared for it at all. As per the rules of the school, he had to attend the remedial class. It came as an insult to Rahul. He fumed with anger and rage. He approached his teacher and told, “I’ve always topped the class. You cannot add me to your remedial classes”. His teacher calmly told, “Rahul, you have to be patient. It’s not always that things will work in your favour. Rule is a rule even for a fool. You’ve scored below 25% and you ought to attend remedial class. Don’t lose heart”. Rahul found it really hard to sit in the remedial classes. He thought it was an insult and considered himself to be a low achiever and he started losing his confidence. After 25 days of coaching, the second preparatory was announced. Rahul had lost all faith in him just because of the fact that he was made to attend remedial classes which for poor achievers. His scores were low in second preparatory too even though he was healthy this time. She then explained, “This 500 rupee note is a 500 rupee note even when it’s partially mutilated. It has not lost its value just because it’s become a little dirty. Similarly, you must believe in yourself that you’re special. Just because you scored less in a couple of tests, you shouldn’t stop believing in yourself. You must be courageous and face it. Everyone will hit down in the dumps of life. But never stop believing in yourself. You will never lose your value until you believe and love yourself”. The words told by his teacher started to repeat in his ears again and again. He was impacted by those words so much that he recalled it again and again. This life lesson by his teacher hit him hard and he regained his self belief. Slowly, he started believing in himself again. He concentrated in his studies and thought he is capable of doing things better. He felt that he was always a champ! Only that he had hit the downs of life. His self belief which he regained started showing him results. He performed better in his third preparatory exams. This time he wasn’t asked to attend the remedial classes. He also stopped his habit of looking down to people who were attending remedial classes. Instead, he went on to motivate them. The board exams soon approached and he came out with flying colours! The lesson he’d taken back home that day was a lesson for lifetime! He never lost faith in himself from then on. There was no turning back from then on! Because he knew his value! He knew what he was capable of and he didn’t let the miseries of life have a negative impact on him! The simple 500 rupee note had transformed him for life! Thanks to his teacher… And yeah.. the 500 rupee note too!